Oh Boy | how's it going, eh? 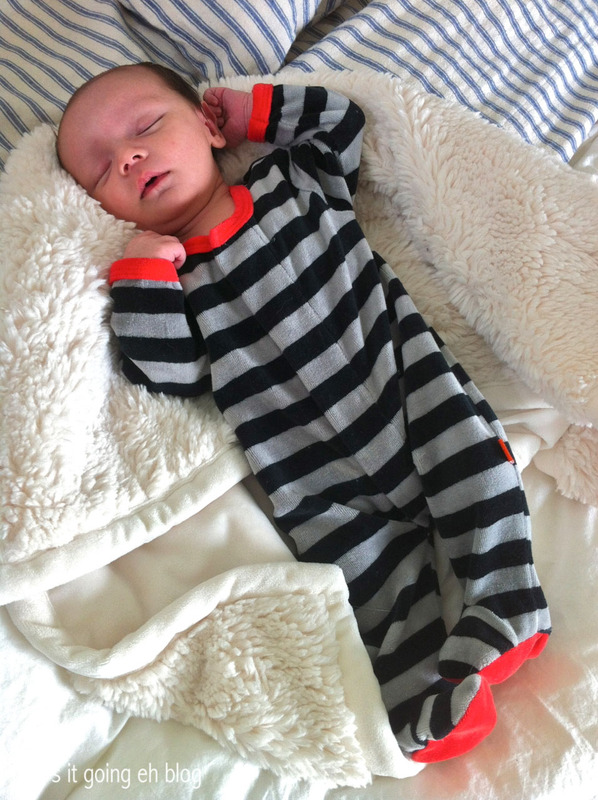 Dearest friends + family this will be a short post – mom here is operating on very little sleep! Sleepy!!! Langdon Takehiko David Fayle was born at 11:15pm on Saturday, April 5th 2014 at 8lbs 22 inches!!! And what a birth…straight out of the birth canal + whisked away by the NICU team. Meconium Aspiration Syndrome. My poor baby. My first visit to the NICU on the night of his birth. My own mangled, IV ridden hand is at the bottom right touching his little foot. I could cry right now thinking about seeing him in that bed. Luckily the maternity ward was not overly busy, so they let me stay for four nights. We made round the clock visits to our little guy. Look how puffy I am from all the pitocin pumped into my system during labor. Oy vey, the labor – that’s another post in itself. Here Jeff + I are trying to make brave faces. We were so frightened, worried + sad..
All I want to say is thank god this child was born in Canada. 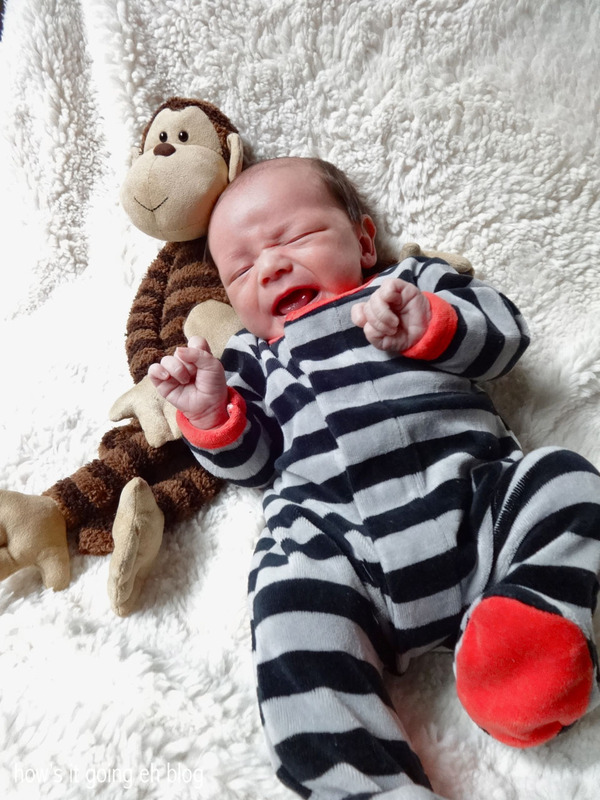 Langdon was in the NICU for seven days. If he was born in America we would be broke as a joke right now. 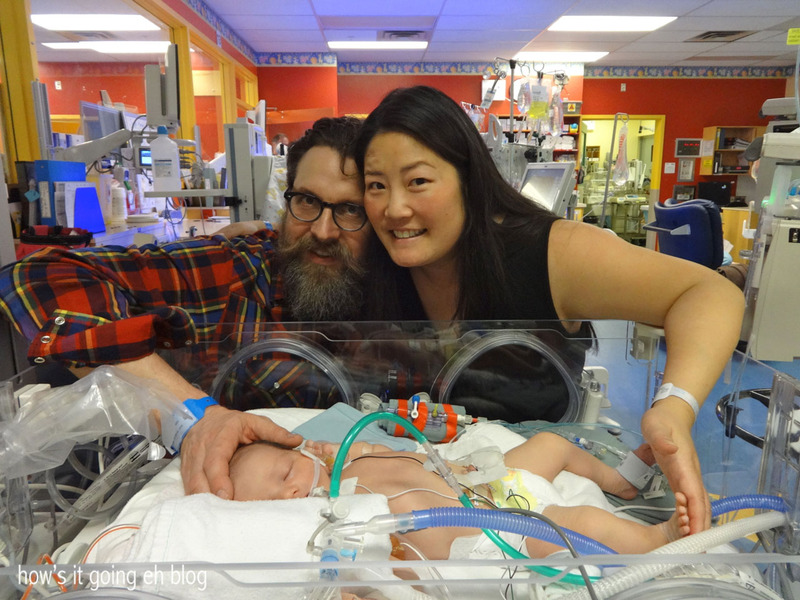 The care from all the staff at BC Women’s Hospital was above + beyond exceptional. Langdon made a swift recovery + was out sooner than expected!!! Those cheeks! He has been home now for two weeks!!! Happy + healthy – so cute I just want to bite his little face!!! Except for the breastfeeding….it’s been hell. This is my current all time favorite picture of him. He was born with long hair at the sides + bald on top! It cracks me up! I call him my Little Monk. The NICU nurses called him George Constanza. Guffaw! He is already smiling + here he is mimicking his dad with his tongue out! Genius! 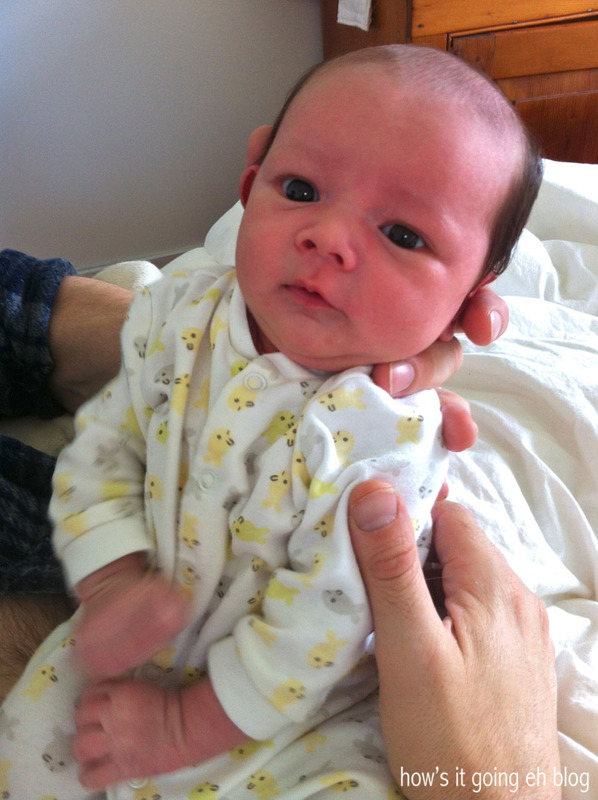 By the way, I got his first smile when late one night calming + feeding him I sang him Carly Simon’s “You’re So Vain”. Smile. Sassy. My favorite line from that song is, “You’re scarf it was apricot”. Bomb. 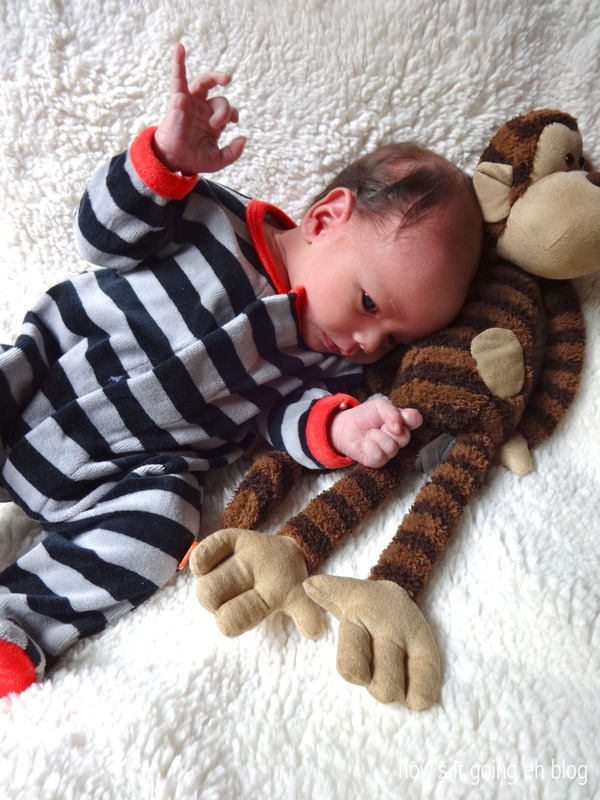 Photoshoot from today with his monkey from Auntie Deb. Three weeks…it feels like it’s been 3 months. Ack!!! Doh!!!! Tumble! These newborns are like little uncoordinated drunks!!! Okay, okay! Cut!!! We’re done! Too much, it’s just too much…good night! Strike a pose!!! He’s beautiful! !! I could have written that same thing. 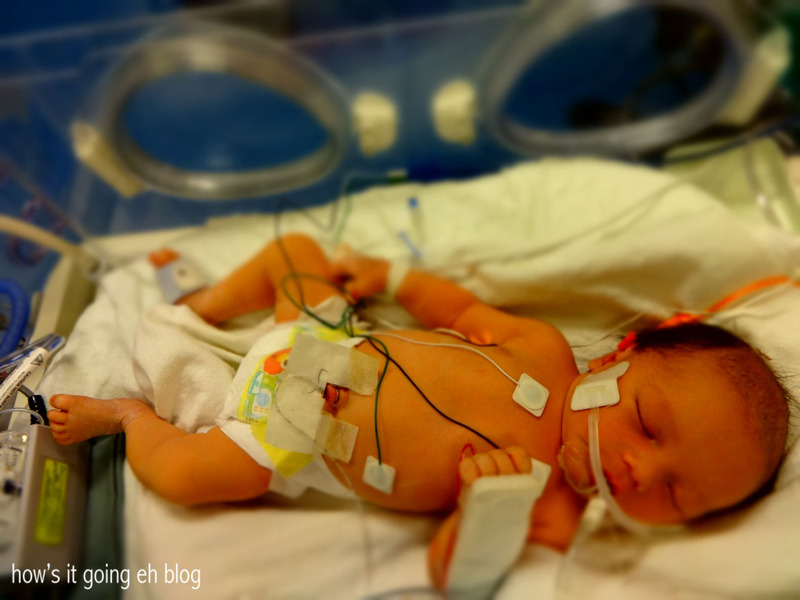 We spent the first 10 days 8 the nicu…same thing. SO scary. Hope you guys are settling in. Keep posting pics! Congrats to both of you. Yup. . . that is at least what they thought. . . he was having trouble breathing – but he was a big baby; just like langdon. He was 8 pds 14 ounces! My sister said that it’s super common for big babies to have a bit of trouble breathing and if they breastfeed and spend time w/mom right after they’re born it regulates, but having him in a big hospital, they whisked him away from us and put him directly in the NICU, pumped him full of wires and antibiotics and tube fed him for a week. Even did a spinal. Saddest most traumatic experience ever. The nurses were A.M.A.Z.I.N.G though – so that’s the hidden blessing – they taught me a lot 🙂 I hope you guys are settling in OK! Awwww – poor little guys! Or shall I say big guys! We are settling in great now! 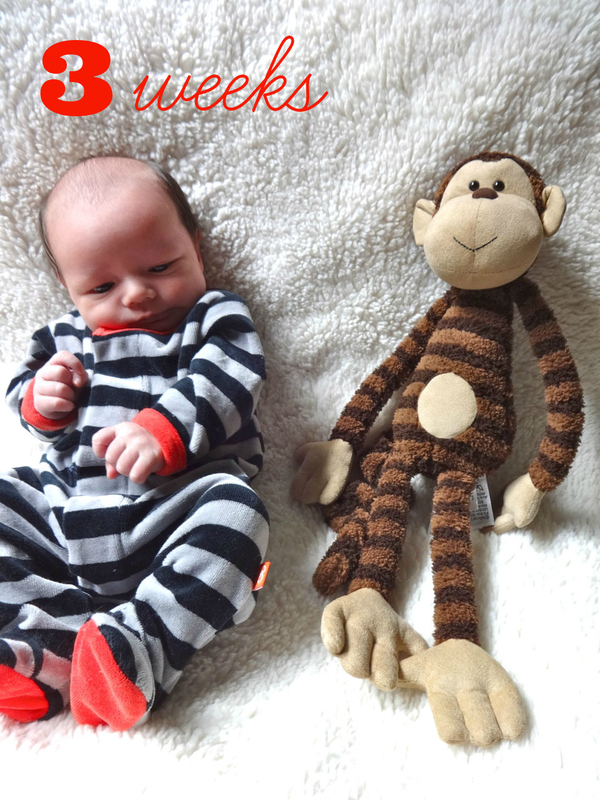 The first two weeks were touch + go, but now we’re figuring each other out! Dawn!!! Yes – we would love to see you!!!! hi, Nan,…”Little Monk”,…the cutest Li’L Monk, ever!!!!! Mom + Ashley were more helpful than they could have imagined!!! He is the cutest, most handsome monk ever!!! Booyah!!!! Biggest congrats! Oh what a cutie-pie! Thank you thank you!!!! Hello to Chi-town!!! p.s. you are sure right about the being born in Canada part! That would have been a CRAZY amount of money! Thanks Deb….we three are so lucky to have you!!!! Yipee yahooooo!!!! Thanks for thinking of us! Do you like his old man hair??? I *adore* the little old man hair! I was reminded of my friend’s little girl, whose baby hair grew out in distinct rows, like someone had cut in a little baby fade. 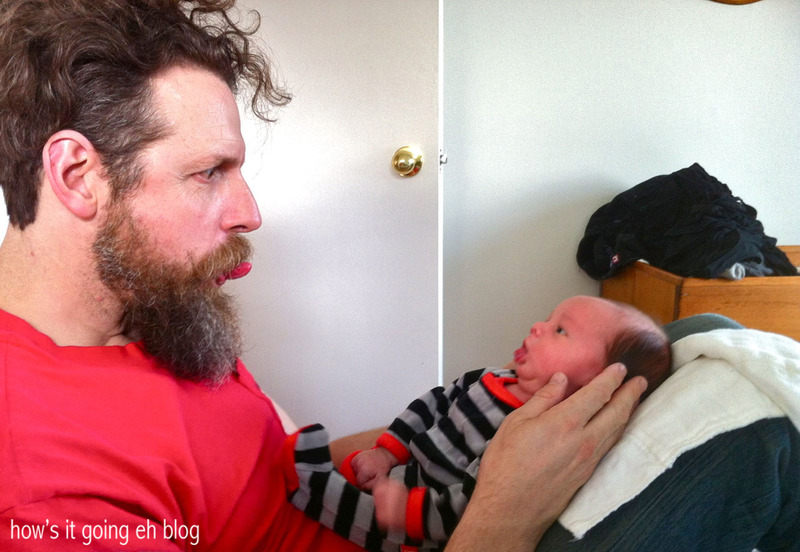 Oh, how we teased that baby… 🙂 I also completely adore “making faces with Dad” time and “I’ve had enough, I’m passing out.” Can’t wait to see what’s next! After you’ve had some rest, of course. Thanks Wes!!! Nice to hear from you! A great big what up to Southern California!!! Hope you + your family are well!!! since motherhood struck me there’s never time to blog anymore but I managed to catch this and just wanted to say congratulations and much fortitude to you the next year! He’s lovely. That’s the perfect way to put it!!! Motherhood strikes again!!! Haha. Oh lord it’s hard finding a second to yourself, eh?! Thank you so much! Much love to you + yours!!! He’s lovely! Sooo squishy. Congratulations, Shelli! Squishy squish smooshie smoosh!!!!! Thank you! Kisses to Peanut! Congrats you guys! He’s adorable, not surprised! Looks like a little scary there for a bit but he looks super healthy and oh so sweet! Jeff will be an amazing dad as you will be a fabulous mom Shelli. All the best to you three! Thanks Lisa + Mark!!! Would love to come up to Golden + see you guys!!! Congrats and glad to see that the lil guy is home and healthy. 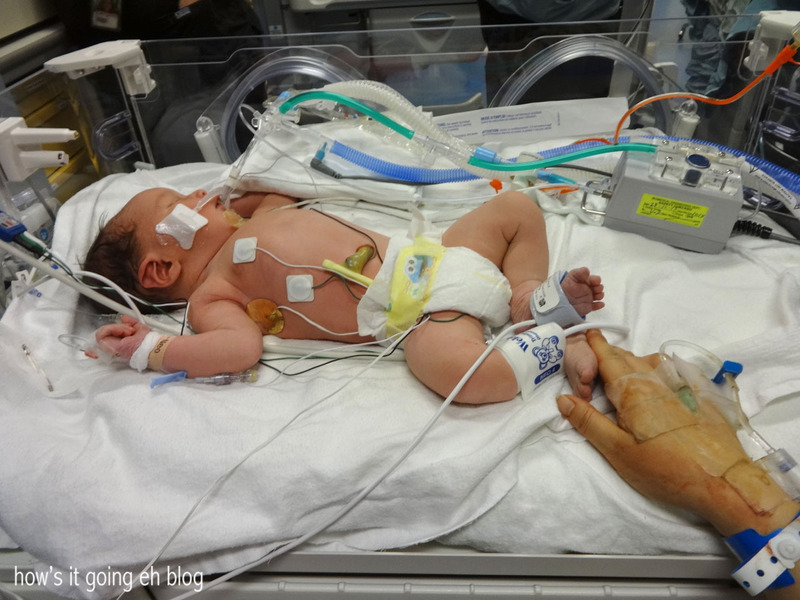 The nicu team is super amazing! Looking at the photos, it looks like Langdon was in the same spot as my girl when she was in that room (she’s been around, stayed in all the wings while she was there). Poor babies!!! It’s so hard seeing them hooked up to all the machinery + being handled constantly, but there is no better team to put your trust in!!! 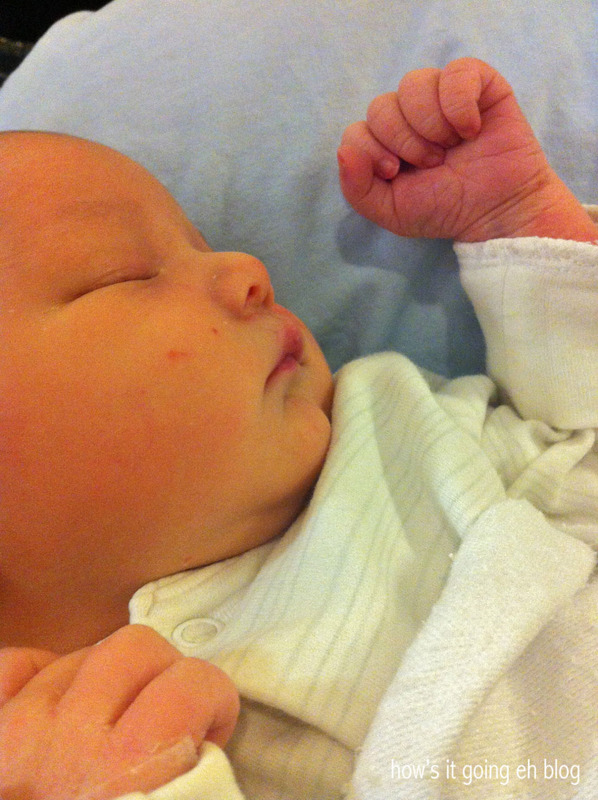 Baby baby Langdon! I am counting down the (hopefully? maybe?) days until this winter when you are released from your gilded, Canadian cage and can come to So.Cal for a visit! Boys are such fun, it will be so great to have our little men meet someday soon! Love and miss you! Hhahahaha!!! My gilded Canadian cage! Oh Adrianna your words are like poetry!!! I know, won’t it be fun to see the boys interact for the first time?! In California!!! Eeek! Gives me goose bumps!!! I CANNOT WAIT!!!!! !